Yesterday, the media pounced upon the results of a poll on the Europe’s most popular zoos, released by the review website, Tripadvisor. Local, national and international press covered the results of this poll, telling readers that “if you are planning a European holiday over the next few weeks, have a look at this selection of marvellous menageries”. The zoos featured put out their own press releases, expressing their delight at being recognised for their efforts. Here we take an alternative look at Europe’s “Top Ten” zoos, and give our top ten reasons to give them, and any other business which holds animals captive for money, a wide berth. We say: The name Loro Parque may be familiar to those concerned with the cruel practice of keeping cetaceans (whales and dolphins) in captivity. It is the place where wild-born orca, Morgan, was moved despite international outcry and concerted campaigning to have her returned to her ocean home. The conditions that Morgan now endures have been described as “a living hell” and campaigners say “she chews on the concrete sides due to apparent boredom and stress, leading to her front teeth becoming dangerously worn to the gums”. In addition, it was at Loro Parque where orca trainer, Alexis Martinez, was killed by a whale named Keto on Christmas Eve, 2009. Keto had been moved from one of the notorious Sea World Parks in the United States. It was Martinez’ tragic death, closely followed by the death of trainer, Dawn Brancheau, at Sea World Orlando which triggered the global campaign surrounding the documentary “Blackfish”; a film which exposed the tragic lives of the orcas held captive by Sea World parks and their associates. We say: During a recent trip to Chester Zoo, welfare concerns were raised over an elephant who was showing serious signs of mental distress. The unnatural and disturbing behaviours demonstrated by the elephant were dismissed as a “bad habit” “like biting your nails” by the zoo. The zoo recently shipped a relatively elderly female to Madrid Zoo; apparently to help them pursue their breeding programme for captive elephants in the UK. The female, Jangoli, who had lived with her companions for 20 years, now lives with just one very young elephant, who she had never met prior to the move. Just days after her arrival, the other adult elephant at the zoo died suddenly. Conservationists also shared concerns raised over the zoo’s sloth exhibit. One expert said she was surprised the shy, nocturnal animals survived in the loud, busy and poorly-designed enclosure which they are forced to live in at the zoo. 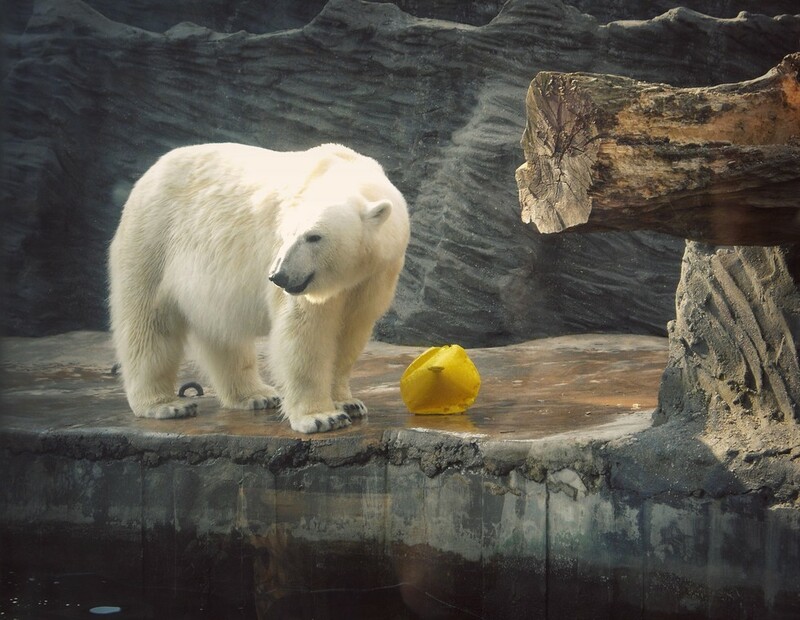 We say: Prague zoo is one of a decreasing number which hold polar bears captive. Campaigners and even some zoos have advocated for an end to the keeping of these wide-ranging predators in captivity as it is argued that even their most basic welfare needs cannot be met in such an environment. Studies have shown that captive polar bears are forced to live in a space a whopping 1,000,000 times smaller than their natural home range. Yet, while they remain a great draw for visitors and some zoos will inevitably continue to keep them. “The loan money that goes to China has done very little, if anything, to promote the conservation of the species. The failure of the Chinese government to do anything with the panda loan money for the benefit of the species went so far that the U.S. Fish & Wildlife Service (which administers the panda loans for the 4 zoos in the States) had to threaten to withhold the next year’s payment ($4 million) unless the Chinese demonstrated that they were honouring their part of the contract”. We say: Bioparc Valencia was the final, and short-lived, home of bull elephant, Pambo, who passed away suddenly at the young age of 21, two months after arriving at the zoo in early 2013. Pambo had been shifted between four different zoos as he was used in the European breeding programme for his species. Like many elephants before him, Pambo lived a tragically short life in comparison to his free-living counterparts. Recent research has shown that elephants live up to three times longer in the wild than in captivity. “Adding any more elephants to the zoo population, either through importation or captive breeding, now looks very hard to justify. There are significant welfare costs to the animals involved, and these are not offset by any real benefits”. The cause of Pambo’s unexpected and sudden death remains in question. Tripadvisor review says: “Was an enjoyable day out. The parrot, dolphin & wild bird shows were very entertaining”. We say: Dolphin and bird shows are little more than glorified circus shows. Thankfully there has been a huge shift across Europe with regard to the use of animals, and particularly wild animals, in circuses, with an increasing number of states banning these cruel spectacles. Perhaps ironically, given the fact that zoos make great play of presenting themselves as centres for education rather than entertainment, the types of shows being banned in circuses continue at many zoos across Europe and around the world. 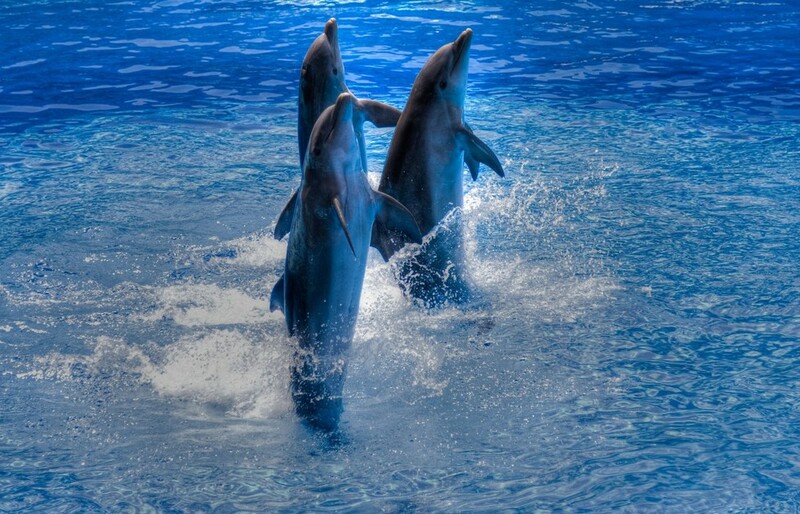 Experts, and even some zoos, agree that the keeping of cetaceans (whales and dolphins) in captivity is fundamentally cruel. Yet the shows remain a great selling point for those that continue to use these intelligent, sentient and naturally wide-ranging animals in degrading shows in swimming pools. 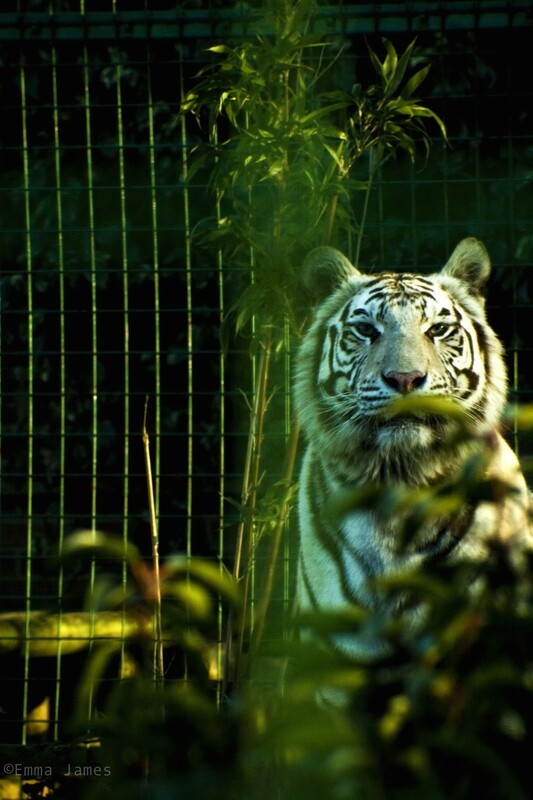 We say: ZooParc de Beauval is one of a number of zoos around Europe which house white lions and tigers. White lions and tigers are, by definition, inbred. This unsurprisingly presents serious welfare issues for the animals. “All white lions are derived from a single small population discovered near Kruger National Park in South Africa. The white coat colour is caused by a recessive gene and the animals are known as leucistic. Leucism is seen among mammals, fish, reptiles and birds, but is only expressed in homozygous recessives. White lions are therefore by definition inbred, and since they all derive from one small founder population, progressive inbreeding can be expected to lead to a number of aberrant disorders like skeletal deformities, immune system deficiencies, digestive problems and neurologic conditions. Even zoo industry body the British and Irish Association of Zoos and Aquaria (BIAZA) is opposed to the breeding of these animals, stating in a published paper on the issue that: “severe in-breeding has resulted in a number of congenital disorders and abnormalities, which may severely impact on the health and welfare of these animals”. But the white lions and tigers are a great draw for visitors, meaning that the cruel and unethical inbreeding continues. We say: Colchester Zoo has gained some notoriety for its repeated failure to safely contain the animals under its care. In the last few years alone, the zoo has allowed a pack of wolves, a lemur and an owl to escape. The lemur was safely recaptured but three of the escaped wolves were shot dead and the owl, who failed to come back during a flying display, was killed by a lion in a neighbouring enclosure. The wolf escape was facilitated by a hole in the enclosure perimeter fence. The wolves paid with their lives for the zoo’s failure to carry out basic maintenance. We say: Following on from the killing of a healthy giraffe named Marius in Copenhagen Zoo at the beginning of 2014, it was revealed that the number of healthy animals killed by European zoos each year was in the thousands. Despite the widespread public outrage at the revelation, the zoo industry was largely dismissive of the issue. In a statement to press on the matter, the head of Paignton Zoo claimed that, in his view, the number of animals killed was “kind of irrelevant”. He said that headlines which claim that “thousands of animals are killed in zoos every year” are misleading. He then immediately contradicted himself to say “Well OK, but you know most of those animals were rats or mice or something like that”. It is clear that, for Mr Tonge, the deaths of some animals are simply not worthy of record, though it is not clear which species he deems to be unworthy of consideration, other than rats and mice. We say: La Palmyre hosts daily sea lion shows, where the animals perform circus-style tricks to laughing and cheering zoo visitors. Like dolphin, whale and parrot shows, these degrading performances – which include the seals “singing” and playing musical instruments – have everything to do with soliciting cheap laughs and nothing to do with fostering respect and concern for animals. La Palmyre also promotes a polar bear exhibit. See comments on Prague Zoo, above. Whilst Tripadvisor reviews may sing the praises of zoos as a great day out, please remember that what is a fun day out for you may constitute a lifetime of misery for the animals. Please don’t visit the zoo.